After a landmark change in legislation allowed PEMEX, the fifth largest petroleum company in the world, to compete with foreign companies for the first time in its 76-year history, it was ready to make a big debut. This presented a critical opportunity to broaden its reach and build a stronger future for Mexico. PEMEX asked us to help develop a global launch strategy with three core objectives: introducing the PEMEX brand to the global industry, building brand awareness, and identifying and engaging with potential international investors and business partners. Engaging with any new market requires sound strategy, so we worked closely with PEMEX to develop a comprehensive roadmap for introducing the brand to the world. Once aligned on a global strategy, we created a brand experience portfolio plan that would put PEMEX in front of the right audiences. We built a robust portfolio of 46 engagements in thirteen countries that included a mix of sponsorships, content marketing, national and international trade show participation, and proprietary events over an eighteen-month time span. Next, we worked with PEMEX to develop a comprehensive brand strategy, including positioning, messaging, and imagery. 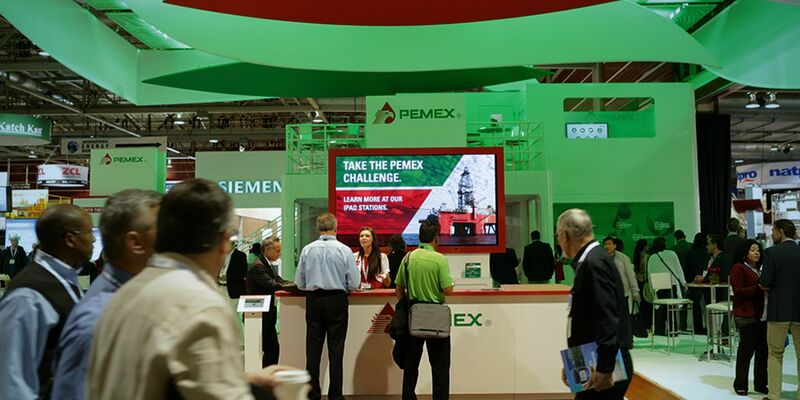 From booth design to dynamic content, our best-in-class creative concepts allowed PEMEX to convey a powerful and consistent brand image that catapulted the company to the forefront of the industry. With programs ranging from small event-in-a-box solutions to large-scale double-deck exhibits and interactive AV and lighting components, a dedicated operations team traveled the globe with PEMEX to guarantee quality, standards and brand continuity. Our focus on measurement gave us the ability to make adjustments along the way to ensure maximum impact. As PEMEX’s needs quickly grew, we worked hard to ensure flawless execution around the world. Through the worldwide reach of Freeman, we were able to support this comprehensive, customized exhibit program and aggressive schedule often on extremely short timelines. Together, we traveled from Moscow to Malaysia, Norway to New Orleans, reaching over 450,000 potential partners — generating thousands of business leads and reaching a total of nearly 450 targets for PEMEX. Overall, the global engagement program has helped PEMEX to secure business partnerships valued in the billions.